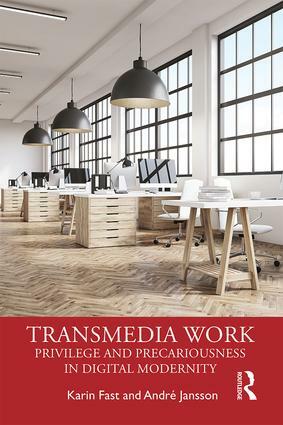 In Transmedia Work¸ Karin Fast and André Jansson explore several key questions that frame the study of the social and cultural implications of a digital, connected workforce. How might we understand ‘privilege’ and ‘precariousness’ in today’s digitalized work market? What does it mean to be a privileged worker under the so-called connectivity imperative? What are the social and cultural forces that normalize the appropriation of new media in, and beyond, the workplace? These key questions come together in the notion of transmedia work – a term through which a social critique of work under digital modernity can be formulated. Transmedia work refers to the rise of a new social condition that saturates many different types of work, with various outcomes. In some social groups, and in certain professions, transmedia work is wholeheartedly embraced, while it is questioned and resisted elsewhere. There are also variations in terms of control; who can maintain a sense of mastery over transmedia work and who cannot? Through interviews with cultural workers, expatriates, and mobile business workers, and ancillary empirical data such as corporate technology and coworking discourse, Transmedia Work is an important addition to the study of mediatization and digital culture.